It’s bothering me for a long time, whether we like more pizza or lasagna for dinner? My husband likes luscious layers of meat, sauces, and creamy cheese hiding between sheets of delicious pasta. And I love it because making it gives a chance to my imagination. 3. What are important things to have in mind? Probably one of the most loved family meals ever. Lasagna originates from Italy, where the first modern recipe was created and published in “Liber de Coquina - The Book of Cookery”. Original lasagna meal was made by interleaving layers of pasta with layers of sauce, made with ragù, béchamel, cheese and boiled eggs. Outside of Italy, this meal is made from mozzarella cheese, various meats (beef, pork or chicken), and vegetables like spinach or mushrooms and flavored with wine or garlic. Aside from imagination and all ingredients, it is of utmost importance to have the proper tool to produce a perfection called lasagna. 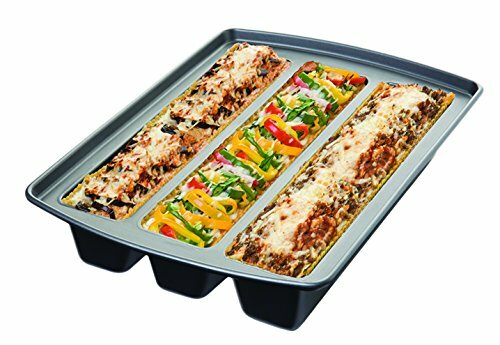 As cooking of lasagna can put your skills to the test, the selection of adequate lasagna pan is as equally important as your cooking skills. So I have spent some time in reviewing other people experiences, types of lasagna pans that they were using, trying to select the best lasagna pan for my family. It was difficult for me to test them all, so I decided to research and select one that I am going to buy. Nowadays pans are made from various materials such as stainless steel, cast iron, glass, ceramic, silicone. All of them have their own advantages and disadvantages, so choose carefully. Very durable materials that are heating gradually to get best-baked lasagna ever. Acidic food does not influence the surface of ceramic or glass pan, so your lasagna will never have that “metal taste”. Using any kind of spatula in this type of pan is easy and you will not damage the inner surface. Well, many of “home chefs” today are pretty much sure that it is always best to have stainless steel dishes. The lasagna case shows that even though it is scratch-proof and rust-resistant, stainless steel is quite poor heat conductor. Aside from this, using acidic food in stainless steel pan is not a good choice since your food can acquire “metal taste” sometime. They are made as compromise between stainless steel and cast iron, even their price range comes somewhere in between. Usually, they are coated with a non-sticky layer, making them a good idea if you would like to purchase lasagna pan. Cast iron is a very durable mixture of steel and carbon. As it is scratch resistant and resistant to deformations it can easily be used either in convection oven, grill or stove. You can also find silicone pans, which are quite good also (their advantage is easier storage), aluminum and copper pans (just like the Copper Chef). Even those materials can be quite ok when selecting a lasagna pan, I would stick to above-mentioned four main materials. It's not that there is any rule on the market but what I have noticed during my reviews is that usually, pans are 2.5 and 3 inches deep. I would call 2.5 inches “regular” and 3 inches “deep” pans. When it comes to lasagna making, I think deeper is better. It gives me an opportunity to make more layers of pasta and meat and provides more space for rich cheese cover (some good rotary cheese graters you can get). Getting deeper lasagna pan is also good if your pan does not have handles. Overall dimensions of today's pan are quite similar, ranging from 13 x 9.5 inches and going up to 13 x 10.5 inches. Standard lasagna pasta is approximately 10 inches in length. Glass or ceramics – glass or ceramic pans are very good distributors of heat. They will not heat quickly but will retain heat for a long time even outside of the oven. The size of pan – have in mind that with every pan you need to go “deep and long” so your pan can accommodate even large lasagna noodles. Here’s a dish which can be used for lasagna, casseroles or serving veggies. Fine glazed porcelain/ceramic is the material used for this pan. Even though it’s one of the lightest pans I’m reviewing for you, it performs well. Its size (13 inches) falls under the standard pan size. The good thing about this one is that you can use it in both microwave and freezer and it is good looking so you won't be ashamed if you serve your dish in it. Another good thing about this pan is that it can withstand very high temperature (up to 500F) so you can also use it in the broiler. This model of HIC Oblong lasagna pan has an underside that is not glazed so it doesn’t slip and slide. As cleaning is important as much as cooking, this pan is quite easy to clean due to its glazed surfaces. Just put some water in it before cleaning or use a dishwasher. 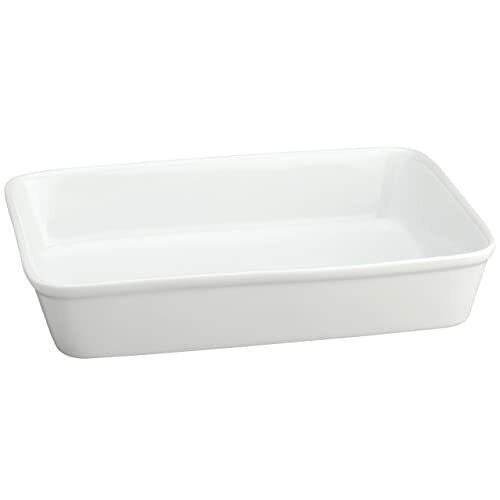 Another good thing about this lasagna pan is that for the same price you get the porcelain dish which can be used also for serving vegetables or even some nice meat course. Having even a small handle would be nice. Maneuvering with a hot pan without handles is quite difficult. Two for the price of one – this would be the initial description for this 4-piece set. You will be getting two pans and two roasting grills in the same package. The smaller pan size is 12.5 x 9.5 inches and the bigger one is 16.5 x 12 inches. The bigger one is a bit deeper. In addition, you get two roasting racks made out of chrome. Both pans have foldable handles for easier removal from oven or storage. Even it is made from stainless steel I cannot say that I didn't notice that bottom of the pans is kind of thin, which is not good from my experience. Not good for heat retention and they tend to warp after some time. Handles are the just right size for my hand, but being foldable can be also an advantage or disadvantage. The good side about folding is that you can store pan easily but bad thing is that when you are reaching for the pan while in the oven, you are just a few millimeters from touching the hot surface. Chicago Metallic Lasagna Trio Pan will push you to the limit! This type of pan can really boost your creativity. Three separate compartments will allow you to cook three completely different meals, all in one pan. Width and length of each channel are the same as lasagna standard noodles, so you do not have to worry about that. Chicago Metallic is made of nonstick coated steel in dimensions of 15 x 12 x 3 inches and it is very light for its category, only 1.9 pounds. One other thing I like about this pan is that it’s not good only for lasagna, but it can also be used for loaf bread or cake. So this practically means that you can make lasagna for dinner and at the same time bake a bread for tomorrow morning. ”…ensuring the product will be free from defects in material and craftsmanship and will last a lifetime under normal use." The price of this pan is above average, but having in mind what you are getting, it sounds like a good deal for me. This Cuisinart lasagna pan comes with roasting rack in the same package. The look is very elegant with mirror finished surface. Size is almost perfect for this size of a pan, 14 inches in length. The pan has two riveted handles, very elegantly made, making it very easy to lift and hold even when it’s heated. With included roasting rack, it provides additional cooking opportunities. Since it’s made from stainless steel, food will not react with this pan, so each and every time you will get the same taste of your lasagna. When it comes to roasting rack, the first thing I noticed is that it is quite heavy (in this case this should mean durable also). Another look and I realized that roasting rack is also made of stainless steel. When compared to others this pan is the heaviest one that I was reviewing. Even the stated size of the pan in specification is almost ideal, real length of the pan (with handles) is around 18 inches which is quite long. When I measured, depth of the pan was also smaller then in specification. 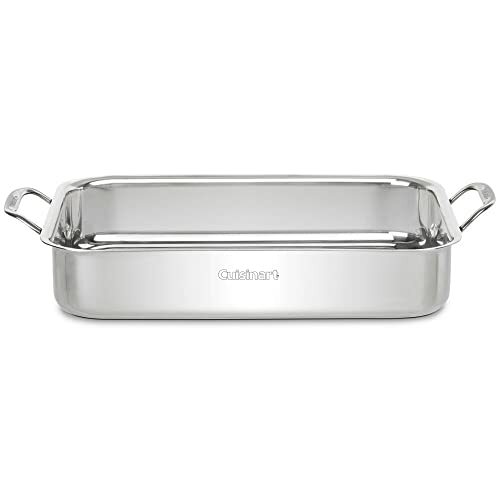 Cuisinart Chefs Classic enameled is a “state of the art” lasagna pan. It is made of cast iron and features porcelain enameled interior which does not impact flavors and does not absorb odors. This pan provides excellent heat retention and very even heat distribution. The handles are made from cast iron and they are very wide and comfortable to use. As far as cleaning is concerned, this Cuisinart pan is dishwasher safe so you can clean it in no time – it behaved really good in my washer. And the last but not the least interesting thing about it is that it comes in few colors and it can be also used as a serving dish. Pan approximate size is 18.2 x 10.5 x 3.8 inches. One important thing to be considered when buying enameled cast iron is that after the purchase, you should take a close look at the bottom and look for any imperfections or small holes. Potential holes in enameled surface will make cast iron rust during the time and that can lead to chipping of enameled layer. In my family, it is extremely important that lasagna is delicious all the time. It is considered as “goddess of the meals” by my sons. Making a final decision and declaring a winner was not an easy choice. After reviewing my top choices for lasagna pans, I would say that Cuisinart CI1136-24BG Chef's Classic Enameled Cast Iron is my favorite one and I would choose it to be my next lasagna pan as it is the best lasagna pan that I was reviewed. Looks very nice when you serve food in it. As we are making lasagna quite often, this would be the perfect choice for us. When you think of the value for money aspect, and put the price on one side and “lasagna perfection” on the other, this pan is still an absolute winner.